I’ll be honest – Boracay was not part of my “must-go-to” list. I had always thought of Boracay as a party place, and partying, while appreciated, is not exactly my top priority when traveling. When it comes to beaches, I usually prefer unspoiled, sometimes even isolated ones – the likes of Danjugan Island, one of my favorites. But friends and travelers I know – even the ones who normally prefer secluded beaches – go and keep coming back to Boracay. I listened to their reasons – some given in excitement, some given matter-of-factly as though it was a given (“Why shouldn’t I go to Boracay?”). And, I read that Boracay was ranked by international travel magazine Travel + Leisure as the best island getaway in the world, and recognized by TripAdvisor as the second best beach in the world. Finally, I was overtaken by curiosity and decided to see what the fuss was all about. 2) Breathtaking sunsets. 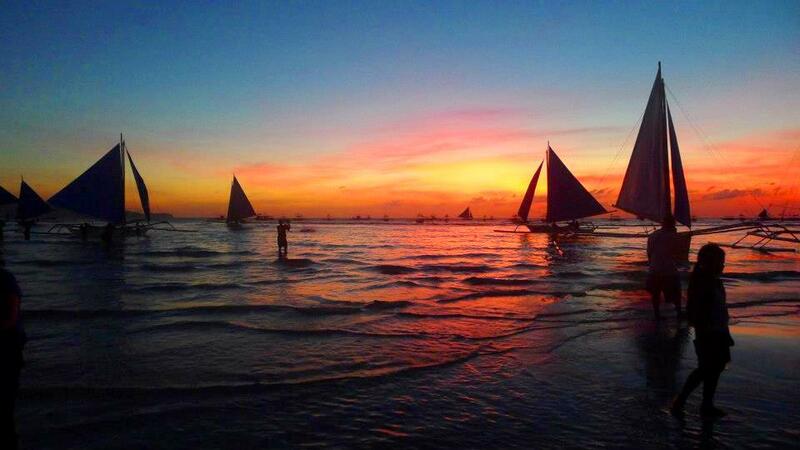 Boracay’s sunsets are probably one of the most photographed ever. While sunsets in any beach generally look good, Boracay sunsets have a charm that lures travelers and romantics at heart. When talking about a Boracay sunset, many people I know get this wistfulness in their eyes, with some even describing it with a tone almost like reverence. To me, what makes a Boracay sunset special is seeing the blue and white sails of the paraws slowly turning black against an orange-pink sky. 2) Choose your own – possibly extreme – adventure. 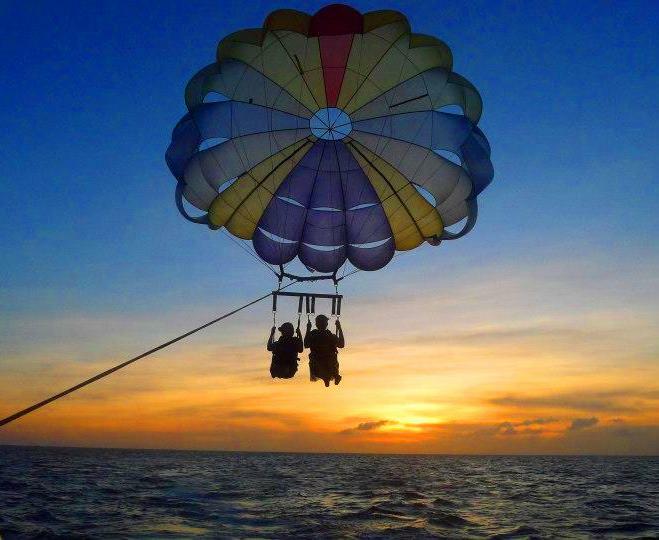 Parasailing, kite surfing, scuba diving, helmet diving and more! Name any water adventure or sports and Boracay can most likely give it to you. It was here that I experienced the exhilaration of parasailing for the first time – being up there, with blue sky all around me and the darker blue of the sea beneath my feet was both a thrilling and meditative experience. With helmet diving, I felt a rush like no other when my feet touched the sea floor for the first time. Walking on the sand and feeding the fish with no diving equipment – save for that helmet that felt lika a breathing bubble – almost made me feel like I was part of the sea myself. 3) Meeting new people + partying. On almost any given night, there’s at least one party in full swing in a bar or somewhere else in Boracay. 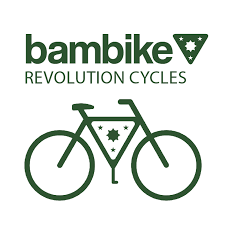 It’s certainly a great way to meet people, but even outside bars you can easily strike up a conversation. I did so with the people I was helmet diving with, and it was fun talking about – and in a way reliving – the rush we experienced on the sea floor. And with Filipinos and people from different cultures all over the world flocking to Boracay, not to mention Boracay locals, it’s easy to meet interesting people. 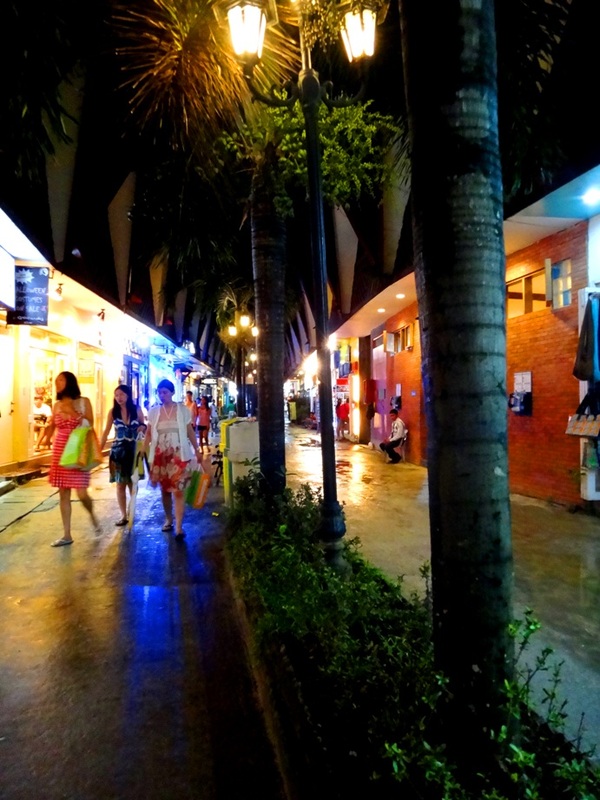 4) Convenience with a capital C. Boracay is a beach paradise, but with the comforts and conveniences of the city. For some, that is the best of both worlds. After beach bumming or adventure chasing the whole day, you can dine in a five-star hotel or your favorite city restaurant, then have coffee at Starbucks. You can even go on a shopping spree at the different boutiques at D’Mall. While some would frown at the seeming commercialization of a beautiful beach like Boracay, others would welcome the convenience, whether openly or grudgingly. After all, you can certainly get everything you need – or want – without hassle. And, convenience is more than just the city experience. 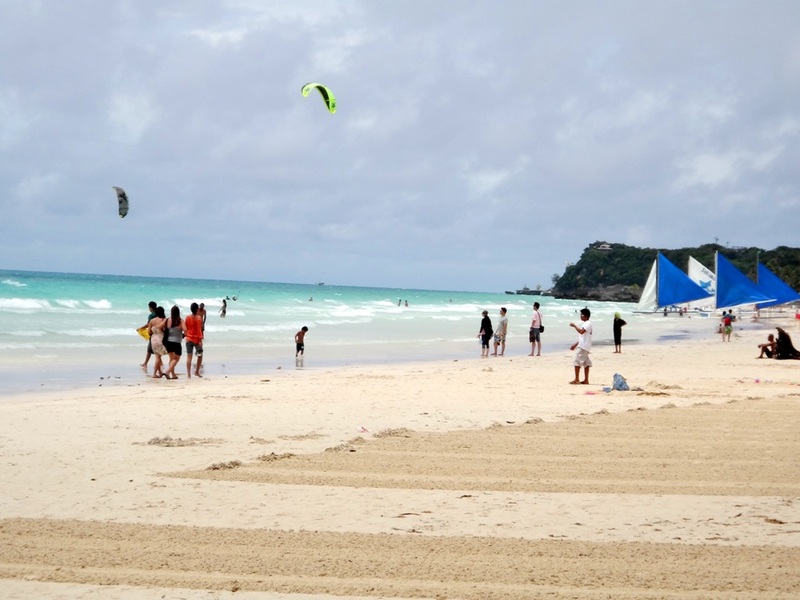 From the cash-strapped backpacker to the jetsetter, Boracay has accommodations and experiences to offer. And, with online resources on Boracay aplenty, it is easy to compare prices and find cheap hotels as well as the more luxurious ones. 5) Create your own (real) experience. 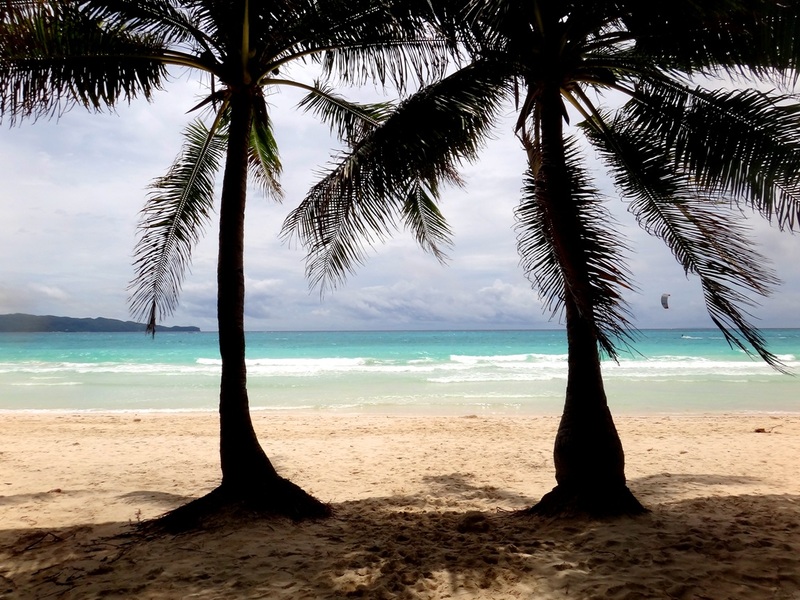 With the crowds and the seemingly commercial feel of Boracay, some find it difficult to have an authentic experience, let alone get some peace and quiet. And yet it is entirely possible to do so. You can always go on an off-peak season (July to October), as I did. Or, amid the beach crowd, you can go on a quest to find your own quiet corner in paradise – yes, there are spots like this, as some travelers have told me. You just have to be patient in looking for them. Diniwid Beach, beside Station 1, for example, still has fine white sand, but with relatively lesser people. And, a more “genuine” or “authentic” experience of Boracay need not be elaborate. I believe you can even have one just by being mindful and observant. 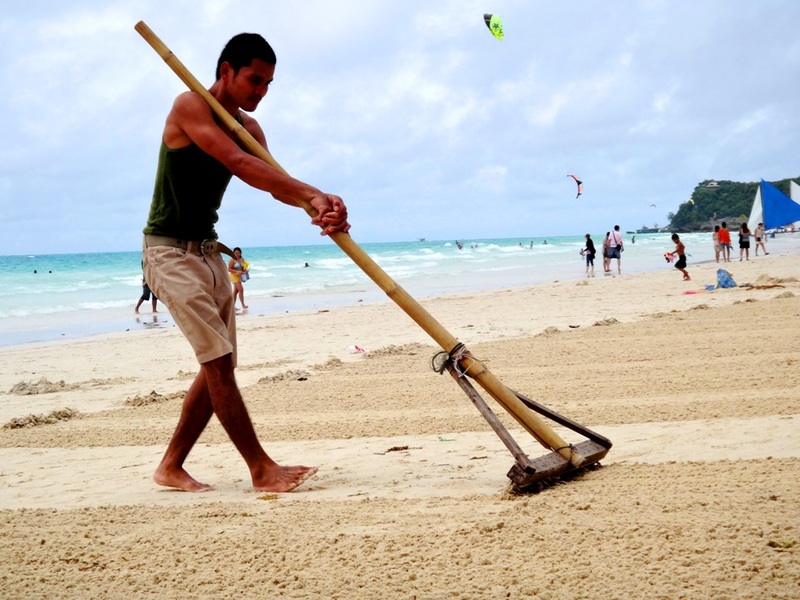 One of the sights I would always remember in Boracay is a local raking the sand flat. I asked him about it, and he said it was to clean the beach. For several peaceful minutes, I watched him purposefully go about his task. Walk around, take in the sights, and perhaps you will notice a gem or two that can lead to a memorable encounter. 6) The Boracay charm or mystique. This is the so-called X factor. I cannot quite figure it out yet, but there really is something about Boracay that draws people in. Beyond the beaches, sunsets, and thrilling adventures, there is something about Boracay – an idea – that keeps travelers coming. Perhaps the pull is greater for some, because I know people who keep going back to Boracay, eventually lived there, and/or got married there. In fact, many couples do tie the knot in this island – or at least have the proposal. There is also the saying “What happens in Boracay, stays in Boracay.” Maybe this promised escape into another world where you can let loose or be someone else, even for a few days, is also what makes Boracay’s charm irresistible. 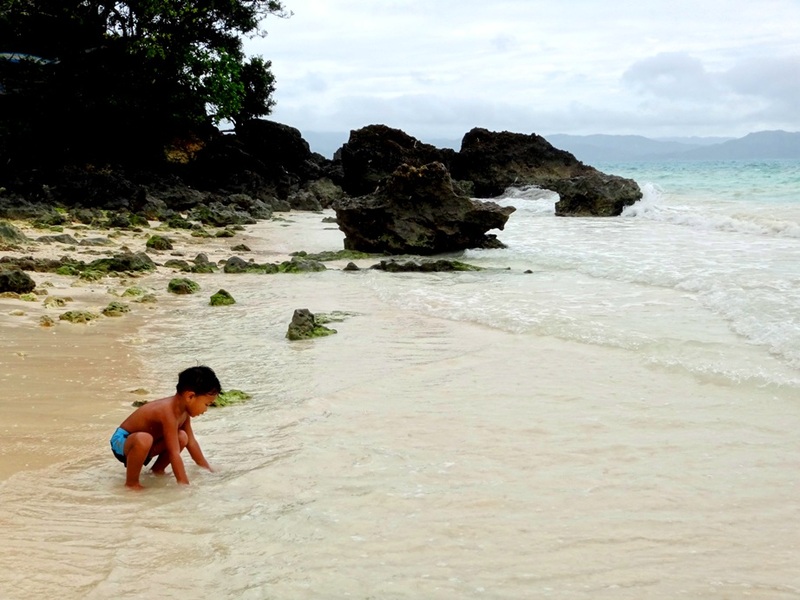 Boracay’s spell may be experienced differently by everyone, but it is there – undeniably. 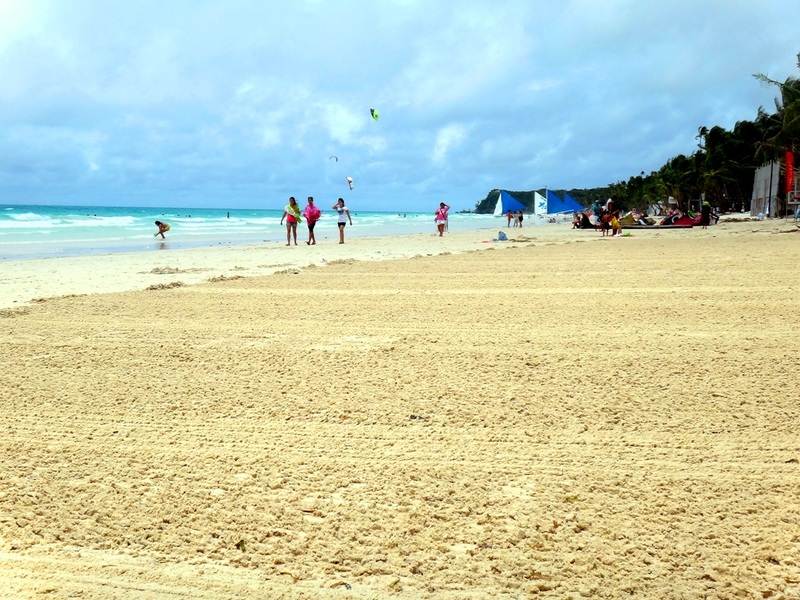 Boracay has a charm that keeps people coming. goodness, indeed, i found boracay the best so far. i’ve been a disbeliever due to its negative feedback, but no, i found it deserving of its title. truelaloo! sunsets are awesome there!